Check out this video on adding a single node. As an alternative to using the Network Sonar Discovery wizard, you can add individual nodes for monitoring. Adding a single node offers more detail in monitoring and is recommended for nodes with high latency. Do not include nodes with high latency in a discovery job. Select the statistics and resources to monitor. 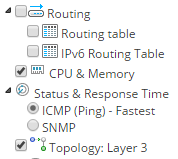 Specify how often the node status, monitored statistics, or topology details are updated. Log in to the Orion Web Console as administrator. Click Settings > Manage Nodes, and then click Add a Node. Specify the node, and click Next. Provide the host name or IP address. Select the polling method, and provide credentials. Select the statistics and resources to monitor on the node, and click Next. If you have defined a custom poller and want to monitor the metric on the node, select the poller on the Add Pollers pane, and click Next. Review and adjust the device properties. 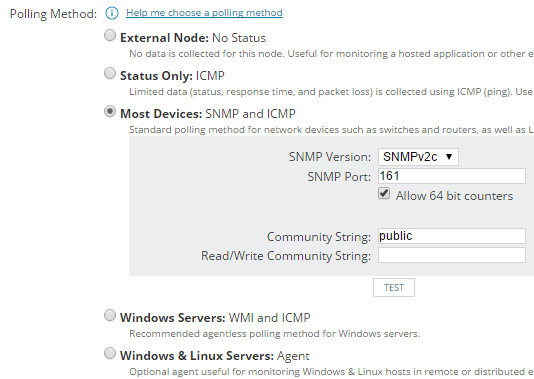 To edit the SNMP settings, change the values, and click Test. To edit how often the node status, monitored statistics, or topology details are updated, change the values in the Polling area. For critical nodes, you may need to poll status information or collect statistics more frequently than the default polling intervals. Change the polling intervals if polling the nodes takes too long. Enter values for custom properties for the node. The Custom Properties area is empty if you have not defined any custom properties for the monitored nodes. See Create a custom property in the Orion Platform. To adjust when the status of the node changes to Warning or Critical, edit alerting thresholds for the metric. Select the Override box and set thresholds specific for the node. The node will be monitored according to the options you set.